Aberdeen Proving Ground, located in Aberdeen, Maryland, is the US Army's oldest Proving Ground. Weapons, chemical agent munitions, military technology and military tactics are all tested on base. It is home to 11 major commands and supports over 80 tenant units. 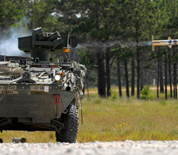 Major commands include The Army's Research, Development and Engineering Command, the Test and Evaluation Command, and the 22nd Chemical Battalion. Aberdeen is a historic city founded in the early 1800s. The Aberdeen Lighthouse is the oldest in America and the Chesapeake Bay offers many opportunities for fishing and boating activities for those stationed at Aberdeen Proving Ground. This Aberdeen Proving Ground directory features the critical info you’ll need to navigate through the many facilities and recreational opportunities available on base.